German Hebraist; born at Hamburg Feb. 24, 1803; died at Hanover March 23, 1880. While pursuing his studies at the Johanneum gymnasium in his native city, he was introduced into Hebrew literature by Isaac Bernays, who exerted considerable influence upon his later attitude toward Judaism and religion in general. He studied philosophy and Semitic languages at the University of Bonn. In that city he became acquainted with Abraham Geiger, who, in various letters to his friends, repeatedly expressed the highest esteem for Frensdorff's character and learning. In 1837 Frensdorff became head master of the Jewish religious school at Hanover, and in 1848 was appointed principal of the new Jewish seminary for teachers in that city, which position he held until his death. 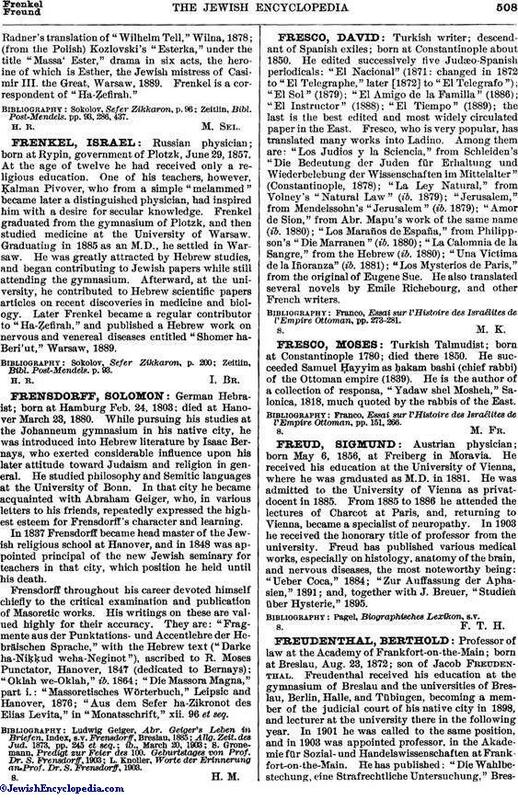 Frensdorff throughout his career devoted himself chiefly to the critical examination and publication of Masoretic works. His writings on these are valued highly for their accuracy. They are: "Fragmente aus der Punktations-und Accentlehre der Hebräischen Sprache," with the Hebrew text ("Darke ha-Niḳḳud weha-Neginot"), ascribed to R. Moses Punctator, Hanover, 1847 (dedicated to Bernays); "Oklah we-Oklah," ib. 1864; "Die Massora Magna," part i.: "Massoretisches Wörterbuch," Leipsic and Hanover, 1876; "Aus dem Sefer ha-Zikronot des Elias Levita," in "Monatsschrift," xii. 96 et seq. L. Knoller, Worte der Erinnerung an Prof. Dr. S. Frensdorff, 1903.